Editor’s note: This is a topic I haven’t covered myself because I’m an advocate for the real thing. However, editing tools, if you use them correctly, can help writers identify certain areas in which they can improve. While I don’t suggest depending on these tools, they definitely don’t hurt. The key is to know why you’re agreeing with whatever the tool says and only making the changes the reason for which you understand. Then, if the change is something you’ve had to do more than once, add it to your style guide so you can be consistent with your flaws and attack them early on in future works. 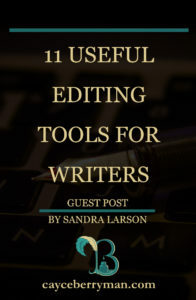 Sandra Larson is going to mention eleven tools that are helpful with descriptions for each. Again, don’t believe everything these tools tell you. Robots do not replace people. Period. Some of what these tools reveal may be true, but you’ll find that a lot of it is found through algorithms and search codes and such that I don’t understand. Anyway, be aware. Don’t be ignorant. While going with the flow of words, sometimes we miss crucial aspects of grammar. The need for editing tools arose when more and more people started writing online, especially when blogging. Automated editing solutions may constantly evolve, becoming more quick and efficient. However, these programs cannot ever take the place of a professional editor because they lack the unique and inherent style and vision that a good editor can successfully detect, evaluate, and adapt to in a writer’s messy and raw work. Algorithms cannot replace immense human imagination, attention to hidden details, or find the right balance and voice. Nevertheless, online editing tools are aimed at facilitating the editing or writing process if a writer is overwhelmed with tasks or needs to edit pieces in a short amount of time. Let’s take a look at the automatic editing tools available. You may get the premium version and get a plagiarism check, get awesome vocabulary suggestions and, citations can be corrected. With over four hundred types of features, Grammarly is one of the most inclusive and extensive tools you can use. It is easy to use. This tool is useful for people who speak English as a second language. Ginger also has two different forms. One for business and one for school. So, even students who are preparing essays may use a different Ginger to write the best essay. This editing tool offers two types of editing options. They can edit as you write or they can edit in a different window. Using the second option, you can keep your original work while still editing the rest of your work. Webspellchecker offers a free trial for thirty days. As the name Webspellchecker suggests, its main task is to help you avoid spelling mistakes, but it offers other services of correcting grammatical mistakes, too. Yes, that’s the name of the software. The advantage of using this tool is that it uses the contextual spelling checker. This means that they will detect correctly spelled words in the wrong context. It is well integrated with other software and WordPress. Many bloggers use this tool, and it definitely could be useful to you, too. GrammarBase, as the name says, sets the base for the best grammar. It helps to avoid embarrassing mistakes in your paper. If you are a writer, you know that some spelling mistakes are not intentional. This tool will help proofread your document, and it works to avoid any grammatical errors. Microsoft Word is not a separate tool for which you need to pay to download an extension. It is used worldwide but never recognized as an editing tool. It actually rephrases incorrectly formed sentences, provides suggestions for words, corrects spelling mistakes, and helps with punctuation. Many different languages can be checked and edited using just Microsoft Word, but, like all these tools, don’t depend on this alone. It has its limitations and isn’t always correct. ProWritingAid might not work properly with a certain type of web browser. ProWritingAid is efficient and fast and helps you eliminate errors, be consistent with style, and find the word you’re looking for. Hemingway Editor is an easy-to-use tool. It highlights sentences that are too complex or, like most of these tools, have writing errors. The application has been upgraded and can be downloaded as a desktop app. This automatic correction tool works at a faster pace. Some of the simple proofreading services are free, but you have to make a purchase to unlock the rest of the services. Apart from offering the basic services, there are plugins available for Microsoft Word. Most of the above-mentioned extensions are present for Chrome, but 1Checker offers plugins for Outlook, Internet Explorer, and others. SlickWrite is one of the most commonly used editing tools. It offers all the services as other tools. What’s special about this editing service? It remembers your settings, and when you are writing, it’s autocorrecting your mistakes. These are some of best editing tools that can be used with your web browser or Microsoft Word. They all perform differently, but it’s difficult to go into detail and discuss each one because they’re all versatile. Look into what they have to offer, try it out, and see how it works for you. You might find yourself using more than one, and that’s okay. Use it! Don’t forget, though, that there’s no substitute for a real editor, but these tools are a great place to start. Sandra Larson from ukessay.com is a born writer. 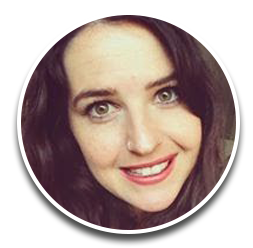 She has a passion for writing from the time she started posting articles. Very expressive as can be expected from her writing, she loves nature. Sandra is a strong supporter of women rights and the right to freedom. She expresses her strong democratic feelings through her writing. Although English is her native language and she has been writing from a very young age; however, she still prefers to use one of the editing tools. I use Grammarly only to double-check a draft since it rarely accounts more creative prose. I tried Ginger, but it blocked posting on two different platforms. And, I had trouble getting rid of it. I like Heminingway because it lets me know if my writing levels are consistent and will prompt me over weak phrasing, verbiage, etc. The truth is, if I’m unsure of a construction, I change it. If I don’t trust my work, I check it with a grammar and style book. If I don’t know it, I learn it. That’s a fantastic practice. 🙂 What stylebook do you use?